Smartphone addiction really does exist. Teens are among the most likely to suffer from it, and could suffer withdrawal symptoms by taking their phones away from them. The problem is, they need to detach from the technology because smartphone addiction can cause health, social and other problems. As parents, you need to be aware of this addiction and what it means to your teenager. This is the best way to combat it and help them in the future. First, you need to determine whether your teen’s use is an addiction or just an obsession. According to the Wales Institute of Social and Economic Research, one in five teens check their phones in the middle of the night. This affects their sleep patterns; and can affect their brain chemistry. They will even post statuses and updates on their phones during these hours! It is an addiction when users are hooked on the devices that their social, personal and professional lives have been affected. 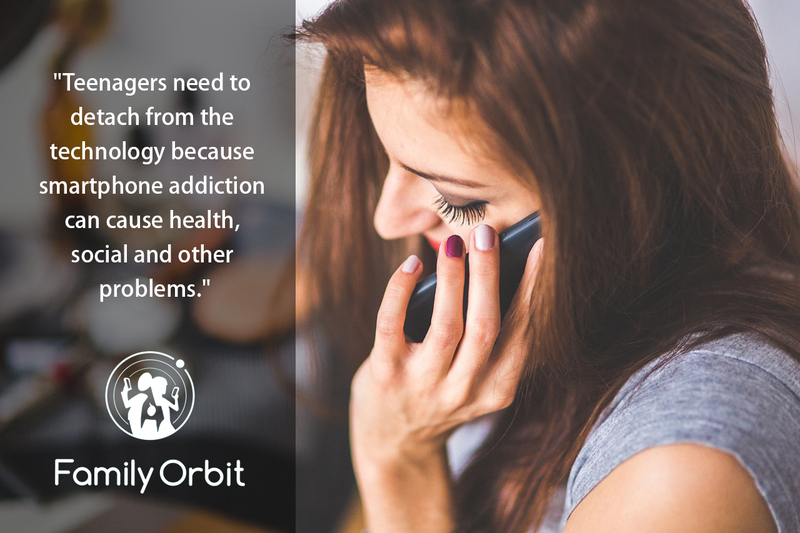 Replace smartphone with alcohol, prescription medications or drugs and you will get an idea of how the addiction can affect your teen. Some teens will constantly check Facebook, while others will play video games or be on YouTube. Whatever they are doing, they could still be addicted to their devices. Smartphone addiction makes it possible for teens to socialize, without actually going out and socializing. They will talk to their friends through Facebook Messenger, text message and apps like Whatsapp. They will use social media to keep up to date. While there are benefits—they get to communicate with people around the world—there is a danger to their social skills. The addiction leads to them not talk to people face-to-face, which affects their abilities to socialize when they are outside. They can be introverted and struggle to make “real” friends. Some will also struggle with work. The interview process means showing social skills. A teen needs to be able to discuss his or her accomplishments and skills, and show he or she can work with others. If the only way teens communicate is through the written word, they will struggle with the spoken word. It goes way too far when teens communicate with other members of the family in the house through text or social media. For some, this is just laziness but it is also a worrying sign that he is becoming too connected to the technological world. There are some suggestions that the addiction alters the mood. There is a lot happening online, whether it is through social media, YouTube or news outlets. Cyber bullying is also a thing that your teen may not be able to escape. Fights happen online because it is harder to tell tone of voice through written words. Smartphone addiction alters the mood and can lead to social anxiety, depression and other mental health issues. The physical health is also affected by these problems. It can lead to other addictions, as teens struggle to cope with everything going on in their online worlds. Another problem with the addiction is that it can lead to families and relationships breaking up. If your teen is struggling with her best friend, it may be because she is ignoring the friend to post on social media. A quick update to say where she is currently located is one thing, but tuning out a friend’s problems to be online all the time takes it a step too far. You will be able to see if this is happen in your own home. Look at the way your teen acts at the dinner table. Is she constantly on her phone rather than chatting to the rest of the family? Does she tend to tune out problems other members of the family are facing? Smartphone addiction is a real thing, and something you need to watch out for. It will affect life in the future and can affect both mental and physical health. Lead by example and set some ground rules in the house for the use of technology, such as no phones at the dinner table.